JNN 23 Feb 2015 Manama : Bahrainis staged a rally in solidarity with Sheikh Ali Hafsay, who was attacked and beaten by the regime forces during an anti-government protest in Sanabis region on Wednesday. The attack seriously damaged the cleric’s eyes, according to reports. The Al Khalifa regime had earlier warned Sheikh Hafsay that he would face prison if he continued his support for the Bahraini revolution. “I will never abandon the revolution until I achieve victory or martyrdom. 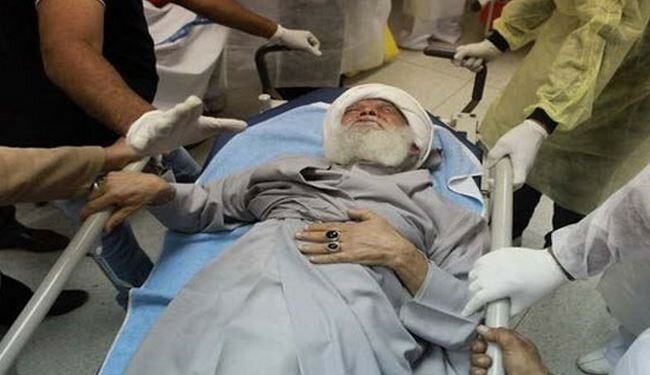 I cannot leave Bahrainis alone and rest at home,” the cleric stated following the incident. The main opposition party, the al-Wefaq Islamic Society, condemned the attack as part of the regime’s systematic crackdown on Shia clerics in a bid to silence the Bahrainis’ voice. The demonstration follows weeks of protests over the detention of al-Wefaq Secretary General Sheikh Ali Salman. This entry was posted in Middle East and tagged Bahrain, Protest, Regime Forces, Shaikh Zayed Hospital., Sheikh Ali, Sheikh Ali Hafsay, Sheikh Hafsay, Shia Majority. Bookmark the permalink.